I am an Irish gent living on the east side of Austin, Texas, with my wife Kim. After 30 years pounding rocks in corporate America it was time to move on and chase a dream. The written word has always meant a great deal to me. I am one of those who writes an e-mail and saves it to draft, then rewrites it again until it screams the message I want the reader to understand with complete clarity. Luckily my writing is more personal these days, 'corporate speak' is not welcome, though it's like kicking a bad habit that won't go away easily. My first book (Yardstick: A Life Measured) was published in March, 2014 as an ebook and paper back. The idea for the story came from a good buddy who pushed me to get it done. For that I am eternally grateful. My second book (The Independent) was published in January, 2015 as an ebook and paperback. It's the second Coach Bob story with a positive message about 'earning it' in life. 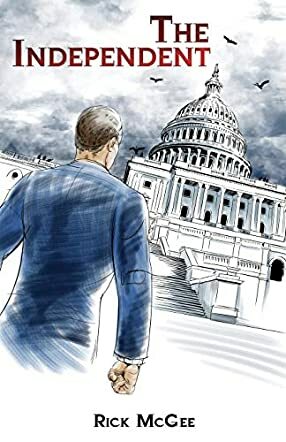 The Independent by Rick McGee is a political fiction novel about a retired coach who is tired of the corruption of politics. When Coach Bob hears another story about the lies and deceit of those in political power, he decides to do something about it. He always held himself and his players to a high level of integrity on the field and he wants to take that same approach to the Senate race. But throwing his hat into the political ring is very different than coaching the team. Coach Bob hopes to use the lessons he learned coaching and teaching to navigate through the shark infested waters of politics. Will he come out unscathed? Can he weather the lies and the smear campaigns and the personal attacks? Can Coach Bob climb up to Capitol Hill and help bring back the morality and integrity that belong in our nation's capital? Or will he crack like so many before him? The Independent is a nice political story that really is very timely in its content, meaning that a lot of people will relate to Coach Bob. Politics needs to change and readers will root for Coach Bob, who exemplifies everything good in life. Rick McGee did a good job of creating a tough, industrious character who believes in working hard and receiving the rewards for that hard work. And I believe readers will relate to that kind of character, especially in today's political climate.